After several weeks of underperforming sequels, including Neighbors 2: Sorority Rising, X-Men: Apocalypse, and Teenage Mutant Ninja Turtles: Out of the Shadows, Pixar's Finding Dory helped breathe new life into the summer box office with a whopping $135 million opening weekend. This weekend, the lovable yet forgetful fish squares off against four new movies all opening in wide release, 20th Century Fox's Independence Day: Resurgence, Sony's The Shallows, STX Entertainment's Free State of Jones and Broad Green Pictures' The Neon Demon. 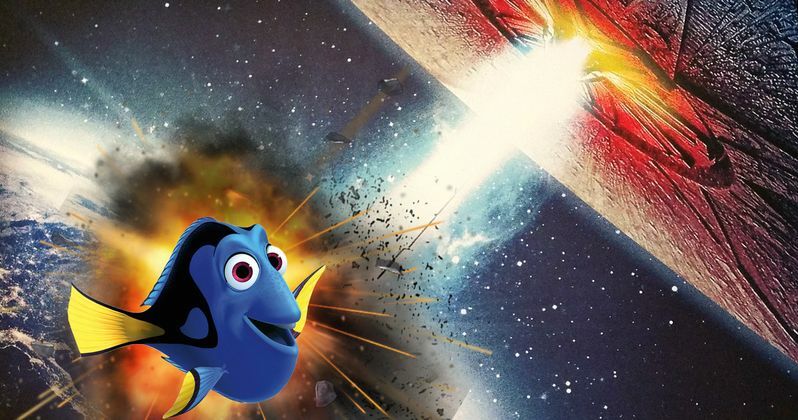 While Independence Day 2 will put up the biggest fight, Finding Dory will most likely prevail at the box office for a second week in a row. Finding Dory's opening weekend haul breaks Shrek the Third's $121.6 million record as the biggest debut for an animated movie, while also surpassing Toy Story 3's $110.3 million mark for the biggest debut in Pixar history. Finding Dory, which features a star-studded voice cast including Ellen DeGeneres, Albert Brooks, Diane Keaton, Eugene Levy, Ty Burrell, Willem Dafoe, Ed O'Neil and Idris Elba, is already a hit with critics, earning an astounding 95% Fresh rating on Rotten Tomatoes. We're predicting that Finding Dory will remain in the top spot this weekend with an estimated $81 million in its second frame. If that prediction is accurate, it will represent a 40% drop from last weekend, which very well could happen considering that none of the four movies hitting theaters this weekend are as family-friendly as Finding Dory is. Box Office Mojo estimates that Independence Day: Resurgence will have the widest opening this weekend, with an estimated 3,900 theaters, which still comes in far below Finding Dory's 4,305-theater debut last weekend. The Shallows is expected to debut in 2,800 theaters, with Free State of Jones arriving in approximately 2,600 theaters, although no estimates were given for The Neon Demon. As of now, Independence Day: Resurgence (43% on Rotten Tomatoes) and The Neon Demon (50% on Rotten Tomatoes) aren't faring well with critics, but no RT figures were ready yet for The Shallows or Free State of Jones. We're predicting that Independence Day: Resurgence will debut in second place with $55.1 million, which would put it just over the original Independence Day's debut of $50.2 million back in 1996. After Independence Day redefined the event movie genre, the next epic chapter delivers global spectacle on an unimaginable scale. Using recovered alien technology, the nations of Earth have collaborated on an immense defense program to protect the planet. But nothing can prepare us for the aliens' advanced and unprecedented force. Only the ingenuity of a few brave men and women can bring our world back from the brink of extinction. Jeff Goldblum, Bill Pullman, Judd Hirsch, Vivica A. Fox and Brent Spiner all reprise their roles from the original 1996 blockbuster. Independence Day: Resurgence will also introduce new characters played by Liam Hemsworth, Angelababy, Maika Monroe, Sela Ward and Jessie Usher. The sequel is directed by Roland Emmerich from a script by James A. Woods, Nicolas Wright and Carter Blanchard, based on characters created by Roland Emmerich and Dean Devlin. Central Intelligence will most likely drop to third place this weekend with $17.4 million, followed closely behind by The Shallows with $17.1 million. In the taut thriller The Shallows, Nancy (Blake Lively) is surfing alone on a secluded beach when she is attacked by a great white shark and stranded just a short distance from shore. Though she is only 200 yards from survival, getting there proves the ultimate contest of wills. It's Jaws for a new generation. The supporting cast includes Oscar Janeda and Sedona Legge, with Jaume Collet-Serra directing from a script by Anthony Jaswinski. The Conjuring 2 will likely round out the top 5 with $13.1 million. Free State of Jones will likely open in sixth place with $9 million. Written and directed by four-time Oscar nominee Gary Ross (The Hunger Games, Seabiscuit, Pleasantville), and starring Oscar winner Matthew McConaughey, Free State of Jones is an epic action-drama set during the Civil War, and tells the story of defiant Southern farmer, Newt Knight, and his extraordinary armed rebellion against the Confederacy. Banding together with other small farmers and local slaves, Knight launched an uprising that led Jones County, Mississippi to secede from the Confederacy, creating a Free State of Jones. Knight continued his struggle into Reconstruction, distinguishing him as a compelling, if controversial, figure of defiance long beyond the War. The top 10 will be rounded out by Now You See Me 2 ($5.8 million), Warcraft $4.3 million, The Neon Demon ($3.9 million) and X-Men: Apocalypse $2.8 million. Also opening in limited release this weekend is Independent's sci-fi action-thriller The Call Up, Sony Pictures Classics' documentary Eat That Question: Frank Zappa in His Own Words, Argot Pictures' documentary From this Day Forward, The Orchard's Hunt for the Wilderpeople, Strand's dramatic comedy The Kind Words, Cohen Media Group's drama Les Cowboys, A24's comedy Swiss Army Man and IFC's documentary Wiener Dog. We don't know yet if these limited titles will expand in the weeks or months to come. Looking ahead to next week, three new releases will hit theaters in wide release, Disney's The BFG, Warner Bros.' The Legend of Tarzan and Universal's The Purge: Election Year. Also opening in limited release is Music Box Films' drama The Innocents, The Orchard's documentary Life, Animated, Roadside Attractions' drama Our Kind of Traitor and Magnolia's horror film Satanic. Be sure to check back on Sunday for the box office estimates, and again next Tuesday for the next round of predictions. Until then, check out our projected top 10 below.